So you hook the ball every now and then. Don't worry about it, we all do. So does Tiger, and Phil and every golfer on the PGA and LPGA tours. Golf is a beautiful game but it sure can be frustrating at times. To ensure a great game this Spring and so your skills don’t rust while you’re stuck indoors watching the snow pile up, here are some indoor exercises to try. Do one or do them all — they’re designed to help you keep your special touch out on the links. Yes, we know: golf is your thing, not yoga. But the long, cold months of Winter have a tendency to cause stiffness in your body. That can limit your range of motion, which — guess what — will drastically undermine your ability to swing a golf club. You don’t have to go hog-wild with the yoga classes in order to enjoy the benefits of yoga. Even just 10 minutes a day can help improve flexibility and core stability. Check out YouTube for short, easy yoga routines that you can do in your living room. This one’s a no-brainer. If there’s one way to shave off a few points, it’s to improve your short game — and if you’re doing this at home, focus on putting. Chipping indoors might get you in trouble with your better half! The nice thing about putting indoors is that carpet does a great job of simulating the green. Contact your local Pro Shop and book a session with a golf coach. Ask to focus on grip technique and they’ll probably show you how to lighten up and loosen the tension in your hands and in your arms. Then, you’ve got a few months to practice with your clubs indoors while watching TV. 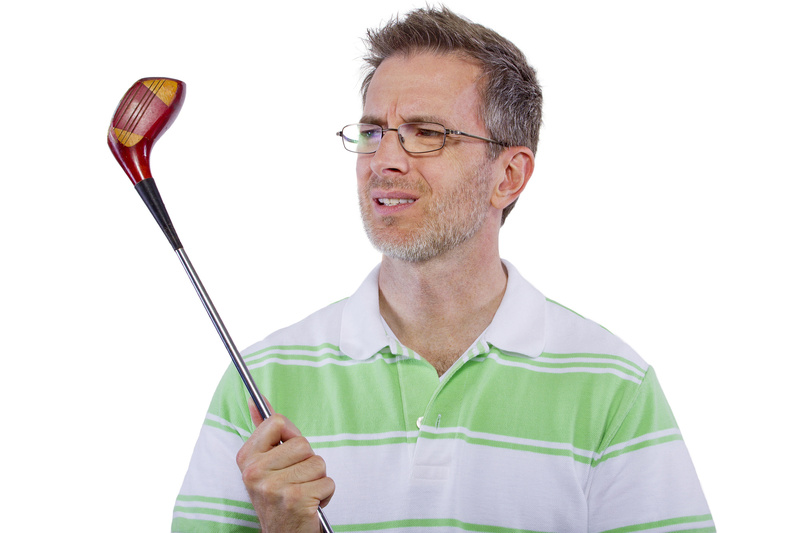 One way to figure out how loose you should hold a club is to start from zero. The idea is to work up to the least possible tension necessary to keep from dropping the club. To do this, rest the club in the palms of your hands with proper hand position, only don’t apply any muscle power in your group. Now, tighten your grip only as much as is required in order to take a swing. That should relax the tension in your arms and shoulders, which can also improve your swing. Muscle memory is a term you’ll hear often in the sports world. Athletes train their bodies to ‘remember’ certain motions they need to excel in their sport. Golf is no different. That great swing you finally achieved late last summer? Your body can completely forget how it worked while you’re sitting indoors all winter long. That’s where muscle memory comes in. Get out your clubs and clear a large space in your home. Work on your swing but use heavier clubs than you normally do. The body’s muscle memory works better when you’re using that extra weight. Finally, it can’t ever hurt your game to hit the weights once in a while. Golf is a sport, after all, which makes you an athlete of sorts. All athletes can benefit from stronger muscles. For golfers, the glutes and abs are important for balance as well as power. So, the final words of advice: do squats and work on your core. Come next Spring, you’ll be fit and ready to take on the world...or at least the golf course!